This summer I worked for the first time in several years with some Belgian Block, installing it in a parking strip in Berekeley. Belgian Block (called setts in some places, there are two photos of guys making them in the quarry photos I posted a little while back) famously came over to San Francisco as ballast in ships. The stones — usually about 5″ x 7″, a size that was supposedly easy to fit between the timbers of the ships — would be off-loaded whenever there was a heavy cargo heading back east and then used as paving for the growing city. You can still buy versions at the stoneyards sometimes, but I mostly come across it when it’s getting taken out of one site and reused at another. It’s better than cobblestone, but still not really the best surface to walk on; not so great for a patio or entrance walkway, just about right for a parking strip. I know, I know, the verboten Mexican Feather Grass. I warned my clients it would reseed in all of the neighbors’ gardens, but they pointed out that all of the neighbors were already growing it. I’ll plant a hundred Deer Grass in penance. 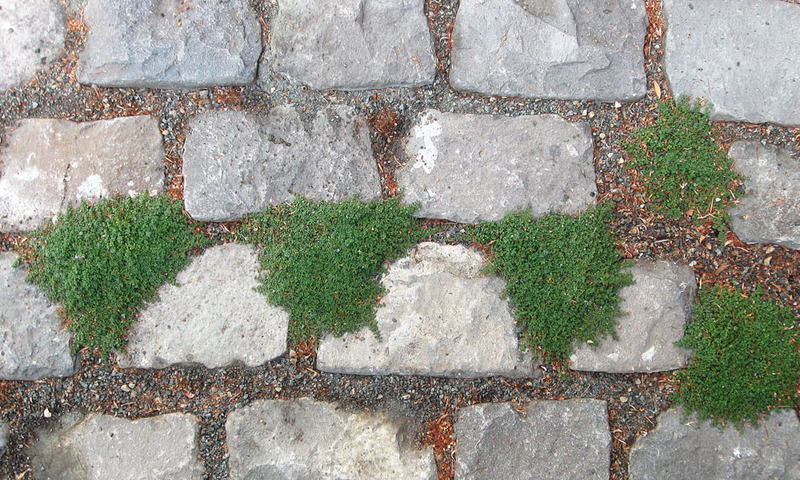 This batch of Belgian Block was once part of the Embarcadero. 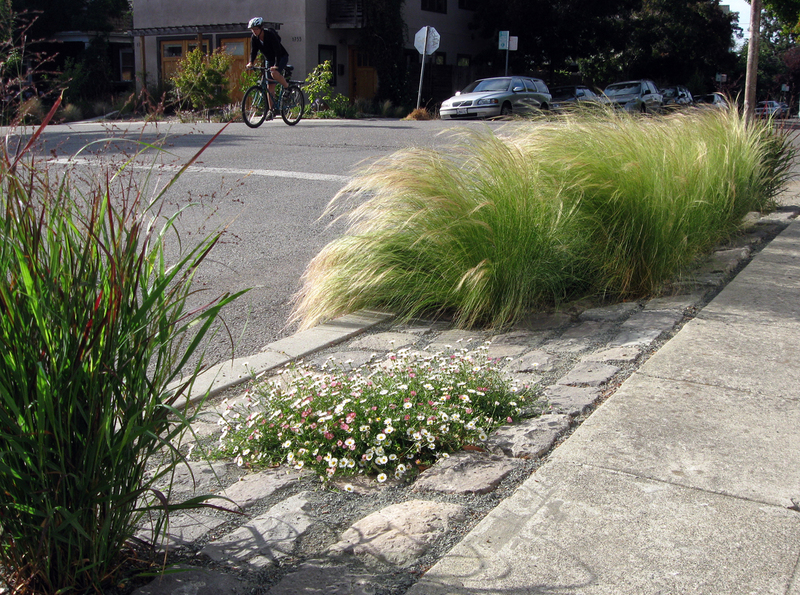 When the city upgraded the paving, they allowed people to come collect it, and my client was one of those who did. He originally set them in mortar for a driveway, then a few years ago he demoed and stored them in pile in the backyard. Now they’ve found a new home in the parking strip, a phase which will presumably last a while, but who knows what they might be used for after that. I usually like to think of my stonework as permanent, but this batch’s peripatetic history makes me like the idea of the stones moving on to a new project at some future date. 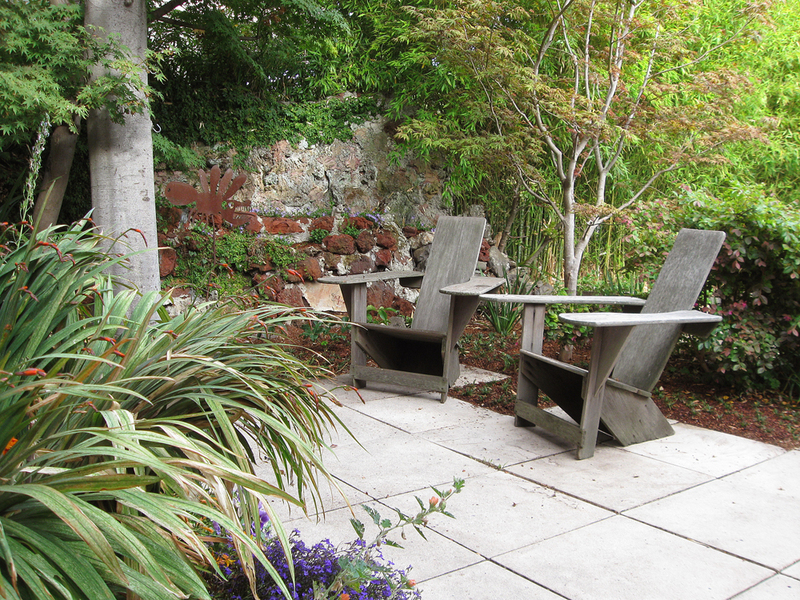 Along with the Belgian Block, the garden has two large, funky walls that were built by a previous owner. 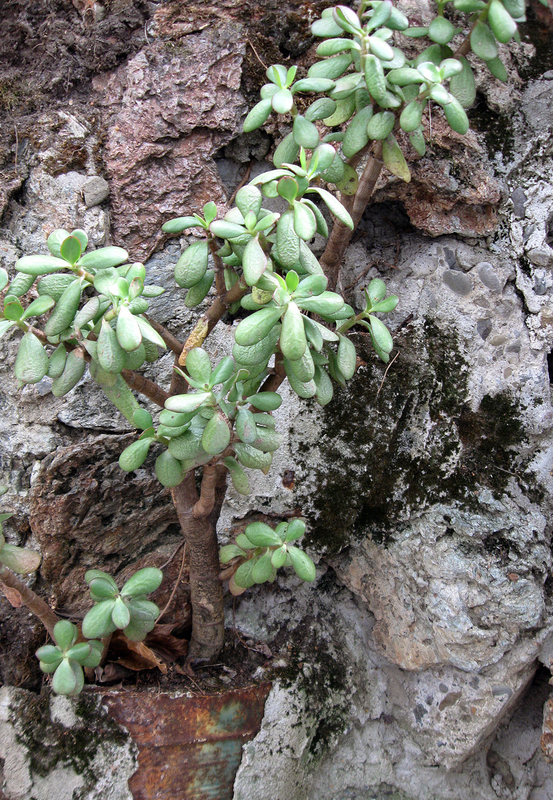 The walls are several feet thick and seven or eight feet tall, with ivy growing from the top and jade plants from the sides. The stonework is pretty crude — a mix of stone and recycled concrete held together with rough, smeary masonry — and the backside of one wall even has chunks of metal in it, including what looks like a rusted out car radiator. But there’s also a certain grace to it. 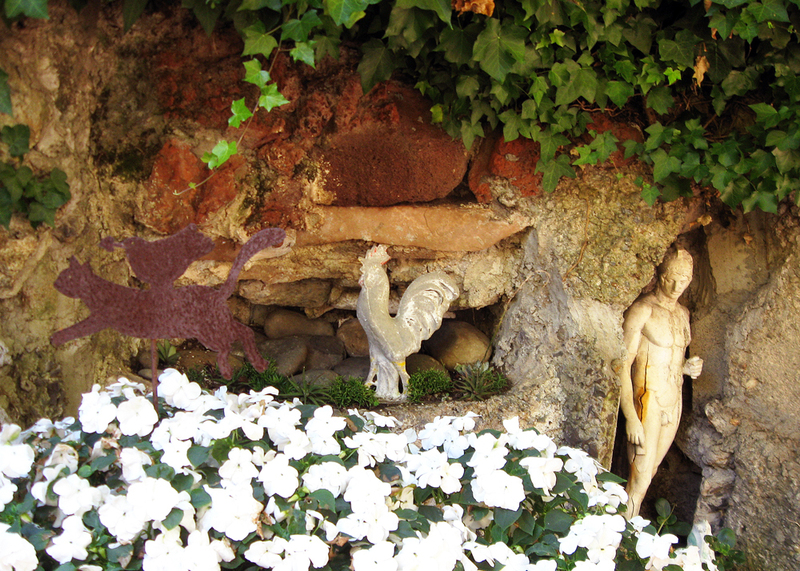 The walls have several cavelike grottos that feel a little creepy but sort of beautiful at the same time. 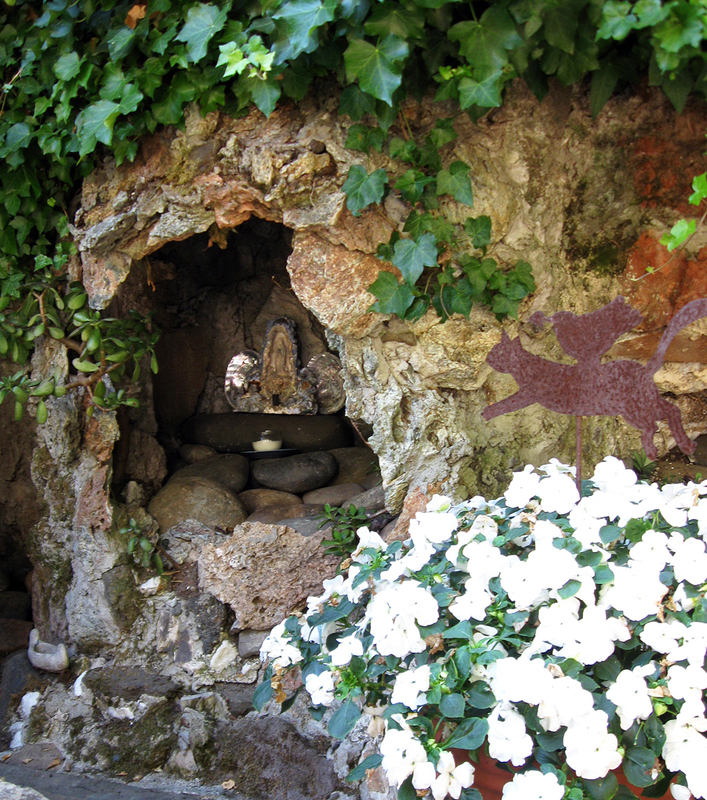 There are a total of four grottos, but the larger ones were too dark to really photograph. I bet they look pretty cool at night with the candles lit inside them. The backside of the main wall is recycled concrete. All of the best rock is on the inside of the wall, none of it on the parts facing to the street. An incredibly insular structure. One end of the main wall has several flower pots embedded in the mortar. The other end has a post in the middle, I guess for a gate that no longer exists. 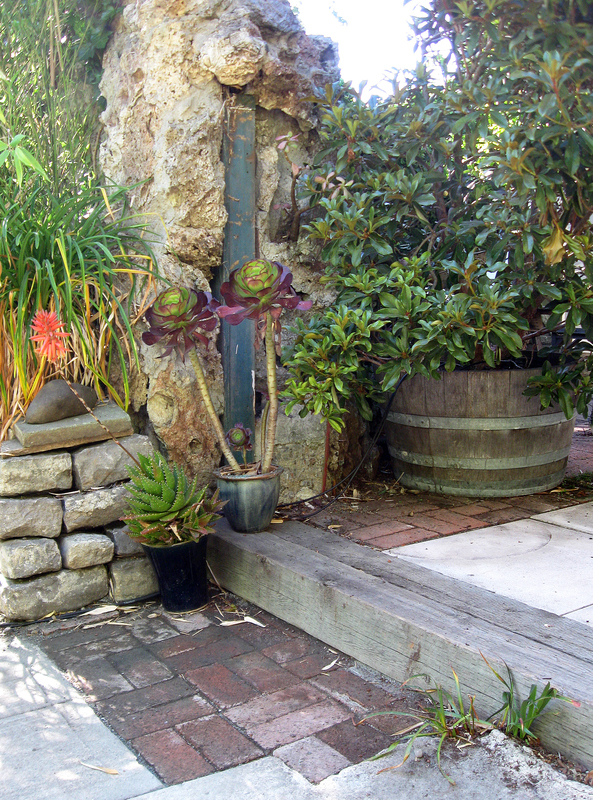 The second wall is in the background of my last photo, with three different kinds of rock, including a single flagstone set as a shiner. 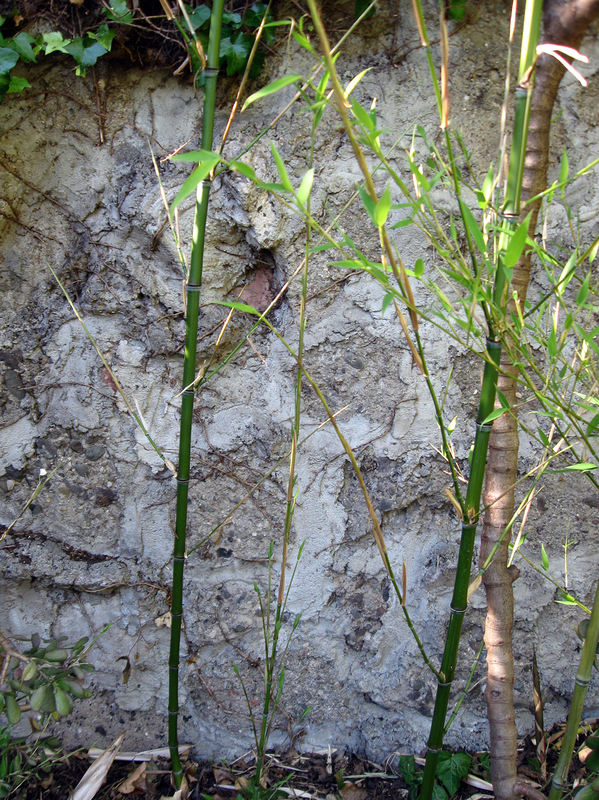 The neighbors have pretty much hidden their side of the wall, the side with the metal chunks in it, behind bamboo. The tree trunk on the left is from a beautiful Purple European Beech and there are a couple of nice Japanese Maples. 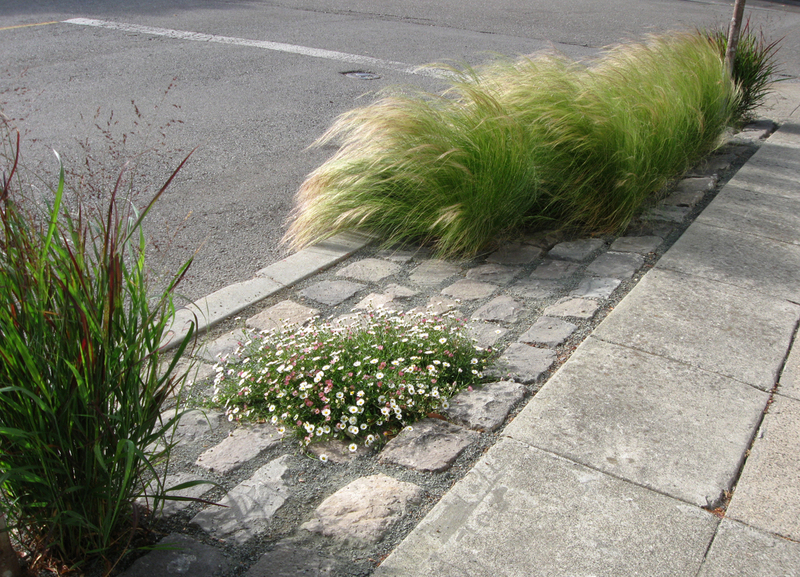 All together, it makes for a very interesting, very funky, very Berkeley kind of garden. This entry was posted on Thursday, August 30th, 2012 at 7:23 am and is filed under flatwork, stone. You can follow any responses to this entry through the RSS 2.0 feed. You can leave a response, or trackback from your own site. I really enjoy your posts about masonry. Nice post! Thanks, Greggo. They accumulate slowly but steadily.